It's the end of 30 whole days of you raising money for a great cause and simultaneously looking like a complete chump. It's time to get rid of the beard. What better way than to use an iconic razor? In fact, razors haven't really changed much since the introduction of the safety razor back in the 18th century. Sure, they have more blades and protection. But more blades, and especially more protection, are for the weak. A single razor blade can make short work of your stubble. Well, maybe after you've trimmed your beard down a little at any rate. The first safety razor was invented by a Frenchman, Jean-Jacques Perret, in the late 18th century. No doubt while stroking his stubble in the way forward-thinking Europeans tend to, he was inspired by the joiner's plane, where the blade just peaks out from guard. After a while, they began to be manufcatured in the UK, then Germany. 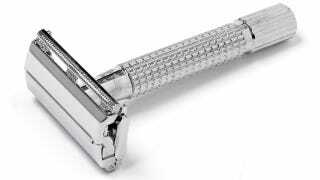 The first US safety razor was patented in 1888, by the Kampfe Brothers. And in fact, it was the US that went all wussy, as it was this new patent that introduced a wire skin-guard along the blade's edge. But the seminal moment in razor design, the one that really changed the way we all shave, was when King Camp Gillette invented the disposable blade which mounted on a re-usable handle. Since his patent was granted in 1904, not much has changed. Disposable razor blades still mount on handles. We're up to three, four — maybe five? I've lost count — blades on the damn things, but the basic design remains the same. But I say opt for a single, disposable razor blade, clamped into a re-usable razor handle this morning. No guard wires, no triple blades and, for the love of God, no electric shavers. Let's play this old skool. Just be careful, and remember to thank Perret and Gillete along the way.